Retail — Welcome to Cheviot, New Zealand! While predominately a farming district, Cheviot has an impressive collection of trades and services that cover just about any project you may wish to undertake, be it build a house, have it painted, dig a dam or fence your property. Cheviot’s diverse collection of shops and galleries stock just about everything you can think of from a well stocked hardware and supermarket to beautiful jewellery, home wares and original New Zealand art – and the kitchen sink! Kerry & Sally-Anne Tull welcome you to Cheviot Four Square. The Cheviot Four Square Supermarket is a busy modern store that is locally owned, managed and staffed. We have a vast range of fresh meats, fruit, vegetables, and deli products, and we stock a number of the major grocery brands. Whether you just need a few bits and pieces, or if you need to do a full grocery shop – we have got you covered! We are the only grocery store between Amberley and Kaikoura, and we are open 7 days per week, including most public holidays and extended hours during the summer months. You will find us in the centre of Cheviot on State Highway 1, with plenty of parking available. Collect your free community newsletter "The Budget" on Wednesdays. Advertising to be in for this by 10am on Tuesday. We are located on the main road opposite the Four Square. Cheviot Hardware – where you'll always get a friendly welcome. 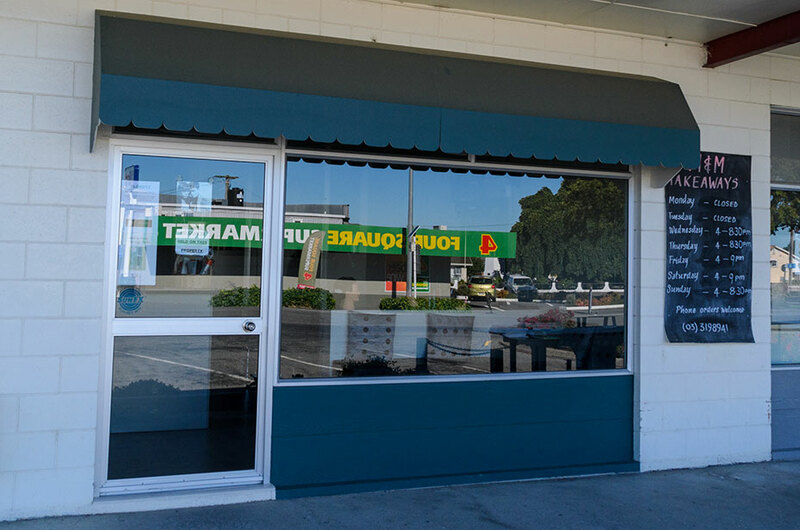 Harris Meats has operated in the Hurunui District since 1957. Originally starting as a corner butcher’s shop in Cheviot, we now operate a licensed abattoir and factory in Domett, and a butchers and delicatessen shop in Cheviot on Hall Street. We supply meat to wholesalers, supermarkets, bakeries, restaurants and cafes, pubs, rest homes and other butchers throughout the top half of the South Island. Visit our website for specials and vacancies! Paul and Lee welcome you to Harvest Glen hazelnuts. We are a small but busy orchard with a focus on quality. We offer a free orchard tour and tasting of our hazelnuts and flavoured hazelnut products by appointment only. At Harvest Glen we have our own processing plant and registered commercial kitchen so we can crack and roast hazelnuts on demand. Our hazelnuts are always fresh and full of flavour. We have a small orchard shop stocked with our hazelnut products with eftpos available. Harvest Glen is situated in the rolling hills of North Canterbury. Here we have perfect conditions to produce top quality hazelnuts with silt loam soils , long hot summers and crisp winters. We are direct to the consumer, specialising in fresh hazelnuts and hazelnut products. Our trees are spray free and hazelnut products are gluten free. The PGG Wrightson Store is situated in the centre of Cheviot, providing service and convenience to both the rural and urban Cheviot community. Our businesses, including Rural Supplies, Seed, Wool, Livestock, Irrigation and Real Estate, are well known and are just a part of a wide network available within the company to provide the best service, advice and expertise. PGG Wrightson Cheviot carries a range of products including, groceries, clothing, seed, agri-chemicals, animal health products, conventional and electric fencing and a wide range of pet and stock feed. The store also has ready access to additional products and can easily source goods and services that you may not see on the shelf. The Cheviot Store 'Team' is made up of a group of friendly local faces, familiar with the Cheviot community. Our qualified and experienced team at Blondyz Salon is here to provide you with a full range of hair and beauty services by our professional and artistic team, leaving you feeling relaxed and rejuvenated.